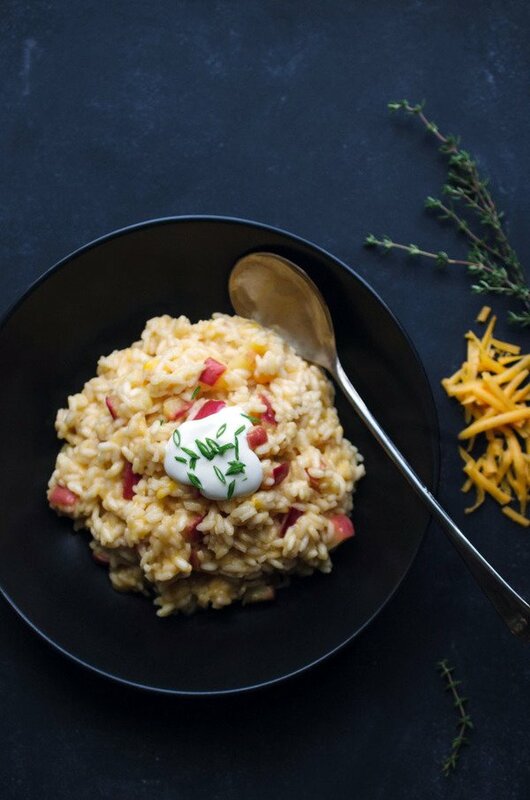 Risotto is one of our absolute favorite comfort food dishes. And this Vermont Cheddar-Apple Risotto is at the top of our most-loved risotto recipes. We think it will quickly make it to the top of yours as well. How can it not with the delicious combination of apples, garlic, thyme, onions, and Cabot Extra Sharp Cheddar? Describing this dish as delicious doesn’t even do it justice - you’ll just have to try it for yourself! After you do, feel free to share the recipe with friends and family on Facebook, Pinterest, Instagram, and Twitter. Begin by bringing vegetable broth (homemade or store bought) to a simmer in a saucepan. In a sauté pan, cook the apples in 1 tablespoon Cabot Unsalted Butter until tender and set aside. Place a heavy 2-quart stainless steel (or other nonreactive pot) over medium-low heat. Add olive oil and remaining 1 tablespoon of butter. Once butter has just melted, add in garlic, thyme, and bay leaf. Reduce heat to low and stir in shallot (or onion), cooking until just translucent but not browned. Add Arborio (or Carnaroli) rice and gently stir with wooden spoon until thoroughly mixed in and warmed, then stir in salt. Next, add white wine and allow it to barely simmer until the wine is almost completely absorbed by the rice. Add in vegetable broth, as directed in the recipe instructions below. After you are done adding broth, remove bay leaf, garlic, and thyme sprigs. Stir in grated Cabot Extra Sharp cheddar and reserved apples. 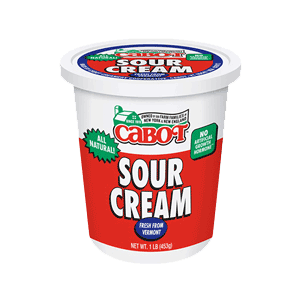 If desired, top with sliced green onions, fried sage leaves, or Cabot Sour Cream to serve. Can’t get enough risotto? Try our Butternut Squash and Cheddar Risotto next! 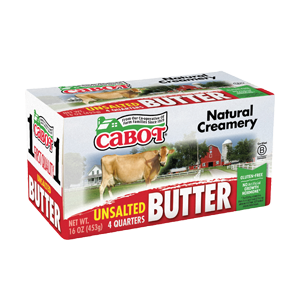 Did you know that Cabot is a cooperative of over 800 farm families who all work diligently to produce only the highest quality products? We’d love for you to share your thoughts about this Vermont Cheddar-Apple Risotto recipe so, if you could rate and review it once you’ve given it a try, we’d really appreciate it! BRING vegetable broth to simmer in saucepan. In saute pan, cook apples in 1 tablespoon butter until tender; set aside. PLACE heavy 2-quart stainless steel or other nonreactive pot over medium-low heat; add oil and remaining 1 tablespoon butter. When butter is just melted, add garlic, thyme and bay leaf. Reduce heat to low and stir in shallot or onion. Cook until just translucent but not browned. ADD rice and stir gently with wooden spoon until thoroughly mixed in and warmed. Stir in salt. ADD wine and let barely simmer until almost fully absorbed by rice. Add enough of warm vegetable broth to just cover rice. When nearly absorbed, add another ½ cup of warm broth. Continue adding broth until absorbed, slightly reducing amount with each addition. Taste along the way and add more salt if needed. STOP adding broth and remove bay leaf, garlic and thyme sprigs when rice is creamy and grains are firm (al dente) but not at all crunchy. Stir in cheddar and reserved apples. Serve in warm bowls, topped with garnishes if desired. Recipe courtesy of Mark Molinaro at New England Culinary Institute. This. risotto. is. delicious! Definitely raised an eyebrow when I first saw it, but I love apples and Vermont cheddar so I decided to give it a try. The texture is perfect and the flavor is amazing! Love the softened apples and the thyme. Thanks, Cabot! This was a delicious cool fall night dinner! I've never thought to put cheddar cheese in risotto before but of course it turned out really well. 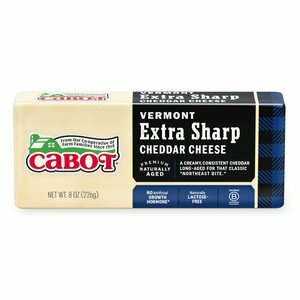 Sometimes it's hard to find my beloved Cabot cheddar in the PNW and I'm glad I had some on hand for this. Hopefully using low sodium broth and not adding salt brought the sodium level down - yikes!